Within the Text refers to those lower-level "right there" questions in which students can easily find the answer in the text. Two examples: What was the main problem in the story? How was the problem solved? Beyond the Text refers to those higher-level questions that often require students to use their own background knowledge to make inferences that aren't directly stated in the book. Two examples: How did the main character change in the story? Why was ____ so unhappy about having to move? 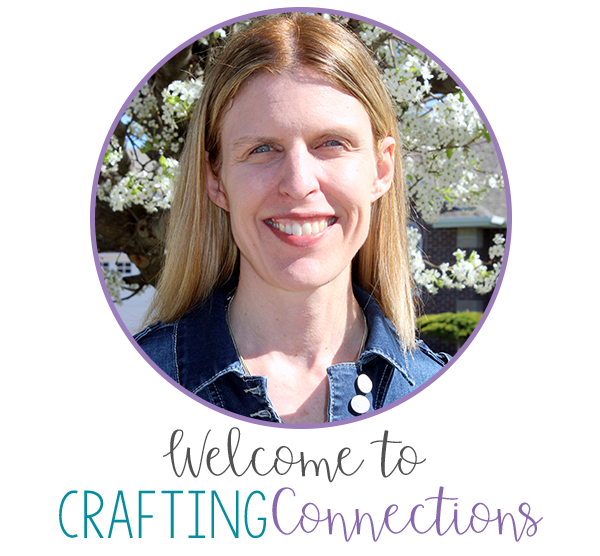 About the Text refers to those higher-level questions that are related to the craft of being an author- the types of things the author did to make the book interesting for the reader. Two examples: How does the author communicate a feeling of _____? Explain the play on words on page ___. As a teacher, I found it easy to ask questions that fit into the first two categories. However, that third category was considerably more difficult. Furthermore, this category was the one that most of my students frequently struggled with. As I read the book to my students, I recorded our thoughts on an anchor chart. As you can see, I created three columns. In the first column, we recorded a "clever" sentence used by the author. In the next column, we recorded what it meant in the book (and whether it was an idiom). In the third column, we attempted to explain what made that sentence particularly clever and entertaining for the reader. I have to be honest... the majority of my students struggled with this- especially at first. But after I explained several "clever sentences" at the beginning of the book, they seemed to be stretching their minds and looking for different ways that the reader could be entertained by various sentences. Better yet, when I revisited this concept later during small group guided reading lessons by asking questions like "Did you notice how the author used an idiom to add humor on this page? ", students were often able to correctly identify the idiom and explain the author's word play. "The jump ropes skipped town." 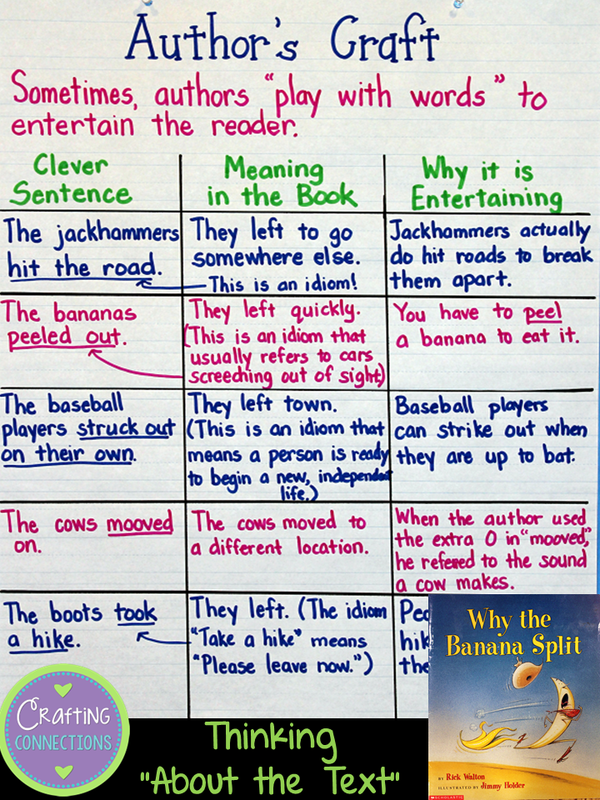 "The bananas split, peeled out, slipped away." "The frogs hopped a train, and that train made tracks." "The basketball players went traveling, while the baseball players struck out on their own." "Good buy," said the shoppers. "Buy, buy," said the shopkeepers. 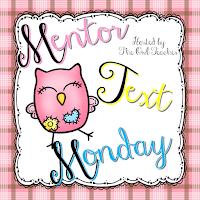 I am linking up with Tammy from The Owl Teacher for her Mentor Text Monday linky party! I bought this book used on Amazon.com recently when we were studying idioms. I didn't think about teaching it from the point of view of "author's craft" (even though that's what the book's purpose really is)! Thank you for this post - now I know how to approach this, using a similar anchor chart, when teaching those types of questions and idioms! Thank you for sharing your wisdom! I need to get this book and I love the way you organized your anchor chart. Love all that you do! Thanks! I love using books like these with my middle school students. It really helps in getting to the core of the skill(s). Thanks so much for all your very practical lessons! Thanks for your ideas and suggestions - this is a terrific resource to help us focus on author craft.